When the Crooked Creek HOA voted to tear down all of the old Amenities and rebuild them in 2009 that also entailed building a new basketball court. The old court was in really rough shape and was much smaller. 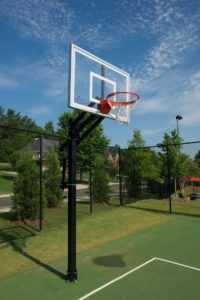 The new court offers two high end glass backboards and a completely fenced in area to help keep the ball in closer when there is the inevitable ‘bad pass’. The new court is one of the most popular features of the new Amenities for the kids. Nearly everyday after school many kids can be found enjoying this great new feature. The gates are coming, the gates are coming.